Webcam Banyoles: Estany de Banyoles - A panorama view over the Estany de Banyoles (Lake of Banyoles) with current weather forecast. L'Estartit: View over the Beach, 22.6 mi. Roses, Costa Brava: Several Webcams, 23.3 mi. Roses, Costa Brava: Port of Roses - La Perola Beach, 23.3 mi. Maçanet de la Selva: Town Entrance, 23.3 mi. Platja d'Aro: Club Nàutic Port d'Aro, 26.7 mi. Calella de Palafrugell - Costa Brava: Webcam Calella, 26.7 mi. El Port de la Selva: Yachting Port, 27.1 mi. Tossa de Mar: Beach View, 28.8 mi. 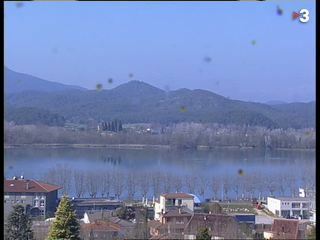 This webcam Banyoles with the theme Landscapes was added on February 7, 2011 and is operated by 324.cat. It got 3633 visitors since then. Shouldn't this webcam work or should the link be wrong please report that here. You can add this webcam here to myCams.